Morinay J, Cardoso GC, Doutrelant C, Covas R. 2013. The evolution of birdsong on islands. Ecology and Evolution online. Abstract. Islands are simplified, isolated ecosystems, providing an ideal set-up to study evolution. Among several traits that are expected to change on islands, an interesting but poorly understood example concerns signals used in animal communication. Islands are typified by reduced species diversity, increased population density, and reduced mate competition, all of which could affect communication signals. We used birdsong to investigate whether there are systematic changes in communication signals on islands, by undertaking a broad comparison based on pairs of closely related island-mainland species across the globe. We studied song traits related to complexity (number of different syllables, frequency bandwidth), to vocal performance (syllable delivery rate, song duration), and also three particular song elements (rattles, buzzes, and trills) generally implicated in aggressive communication. We also investigated whether song complexity was related to the number of similar sympatric species. We found that island species were less likely to produce broadband and likely aggressive song elements (rattles and buzzes). By contrast, various aspects of song complexity and performance did not differ between island and mainland species. Species with fewer same-family sympatric species used wider frequency bandwidths, as predicted by the character release hypothesis, both on continents and on islands. Our study supports the hypothesis of a reduction in aggressive behavior on islands and suggests that discrimination against closely related species is an important factor influencing birdsong evolution. 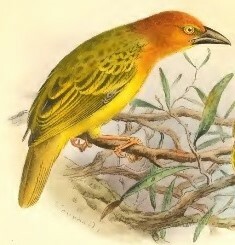 Two weavers are included in this study, the Principe Golden Weaver and Village Weaver, representing island and mainland weavers respectively. There are many recordings on xeno-canto for the Village Weaver, see here.